The latest report from the EPA and Courier Mail today on the 50% decline in Koala Coast koalas in the last 3 years is sobering news. The koala coast region includes the Redlands Council, east side of Logan Council and Brisbane City council. The koala population in the Koala Coast has been identified as genetically different to koalas in other parts of SE Qld which makes them even more important to protect for biodiversity values. The Koala Coast area has had regions "protected" for the longest period of time as koala conservation areas and koala sustainability areas as part of the koala mapping that state government (EPA) has conducted in the past. 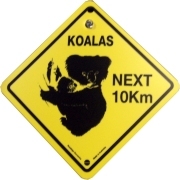 The koalas of the "new Logan" Council area and Scenic Rim have not yet been mapped . Our koalas would certainly be in a worse position. It is also important to note that the koala mapping conducted in Moreton Regional Council also confirmed that their Koala population had also declined. This news as reported on line in the Courier Mail is available here. The Environment and Protection Agency EPA - Queensland government department - has published the findings and report from GHD on its www.epa.qld.gov.au page here. The latest EPA report concerning the decline of the Koala Coast koalas has be provided for us.